Ernest Cutler Price, young, impressionable and determined, couldn’t believe how fast his favourite horse could run. Lou Dillon was some kind of sleek and lightning quick pony. It seemed he won every race he ever ran. Jack Dillon was never unbeatable, but he came remarkably close to attaining that status during his prime years as a rampaging, rambunctious and deceptively clever middleweight. Speedily working his way up from his starting point of the lightweight division, Jack would become known as the Giant Killer, using his natural domain of the middleweights as a springboard for regular and impudent raids on the big boys. In truth, the writers of the day never quite knew what to call the stocky, muscled Dillon, such was his eclectic and devastatingly effective style. A native of the Hoosier state of Indiana, Jack slugged and slashed and tore into his opponents, but he was also slippery, cunning and deftly skilful. He was the Hoosier Bearcat to many, the Hoosier Hurricane to many others. Local sportswriters in Indianapolis dubbed him the Hoosier Clouter. But for the harsh conditions of his time, when many deserving fighters didn’t always get what they deserved, Dillon would surely have been a legitimate world champion in at least one weight class. As it was, he could only manage a claim of the light heavyweight championship and unofficial recognition as the world’s best middleweight. The top middleweights ran away from him and even big Jess Willard blanched after he saw Dillon’s comprehensive thrashing of Frank Moran. How great was Jack Dillon? In some 250 battles, he was beaten officially just seven times, and most of those losses occurred as his hyperactive career was finally winding down. At his absolute best, in the classic 160-pound division, only Frank Klaus and that tragically forgotten genius, Eddie McGoorty, defeated Dillon. Jack fought both men four times, finishing about level with Klaus in the no-decision days but never quite mastering McGoorty. It was a fantastic era for quality middleweights. Klaus was a lineal world champion who defeated Billy Papke and Georges Carpentier and fought a draw with Stanley Ketchel. McGoorty, who held a claim to the championship, could well have been one of the greatest of all if he hadn’t celebrated his victories so enthusiastically. Clever Eddie, from Oshkosh, Wisconsin, had a love of the booze that sadly went beyond common sense, and the hard stuff prematurely eroded his great talent and many skills. In his pomp, he was an exceptional fighter who possessed all the essential tools. His damaging left hand alone became famously known as McGoorty’s Electric Left. Here is how James (Jimmy) Butler, the famous English boxing writer, described McGoorty: “Eddie had learned his boxing in a college gymnasium, where he acquired a style that was a sheer joy to watch. It proved so effective, indeed, that, at the age of fifteen, after fighting three men in one evening, he found himself Wisconsin State champion. “American though he was, he did not fight according to the American plan. There was nothing of the whirlwind, two-fisted, punch-swapping infighter about him. He had, in fact, one of the most perfect English styles I have ever seen in the ring. His long left, straight and rigid as a bar of steel, he used like a rapier. He kept it continually poking and jabbing into his opponent’s face; and always he fought with an icy calm that nothing could upset. “His terrible left hook – McGoorty’s Electric Left – was something to marvel at. It was one of the most devastating punches I have seen – fast, accurate and perfectly timed – and when it connected there was usually no need for the referee to start counting. It took an Eddie McGoorty, then, to put anything past the intimidating Jack Dillon. And Jack did indeed have an imposing presence. The close-cropped hair, the hooded blue eyes, the barrel chest and the thick arms were all disquieting indicators of the fury that came with him. Who did Dillon fight? Just about everybody. His sprawling record is very nearly on a par with that of Harry Greb in terms of both volume and quality. The two whirlwinds actually clashed when Jack was on the wane and Harry was on the rise. It was one of the rare occasions when Dillon lost his composure. Frustrating by his decaying skills, Jack became increasingly red-faced and angry as the sprightlier Greb made hay. Now hold your breath, if you will, and consider some other names on the Dillon record, most of whom Jack beat: Bob Moha, Leo Houck, Hugo Kelly, Jack Sullivan, Joe Thomas, Gus Christie, Fireman Jim Flynn, Gunboat Smith, Charley Weinert, Billy Miske, Frank Moran, Mike Gibbons and Al McCoy. Historian Tracy Callis describers Jack thus: “Dillon was a tough, hard-hitting, aggressive attacker who moved well and possessed an abundance of stamina. 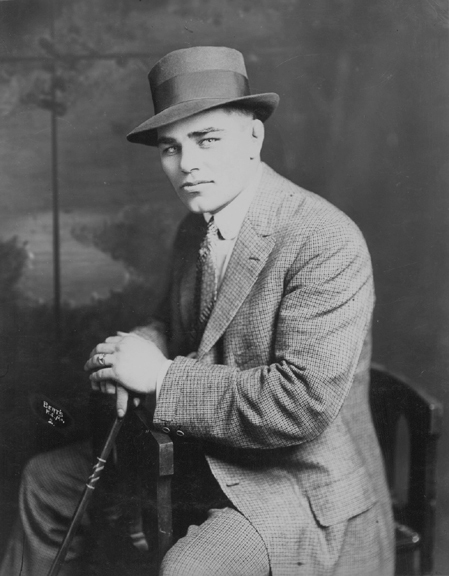 He was considered by many to be a smaller version of Jack Dempsey. “The short and stocky Hoosier Bearcat was a buzzsaw fighter who was very busy in the ring. He applied pressure and had a good right hand punch, but lacked the paralysing power of the Manassa Mauler. Yet Dillon gave his foes a beating. Tough and durable, Jack lost only seven official contests in 249 outings. According to historian and film collector, Mike Hunnicut, legendary trainer Teddy Hayes had all the time in the world for Dillon. Says Mike: “Hayes, who handled around twenty world champions from Joe Gans to Mickey Walker, considered Dillon to be the greatest fighter he ever saw, with the possible exception of Dempsey, and absolutely one of the most decent men he ever knew. Dillon was slick and powerful but was so often outweighed. It was no surprise at all to anybody that the writers of The Ring magazine voted Jack the greatest light heavyweight ever in their special issue of 1969. “You see, from right out of the box, when Dillon was just seventeen, he was considered one hell of a prospect. By the time he was eighteen, he was boxing championship fighters. Being aggressive and fearless, he reached his peak early from 1912 through 1914 as a devastatingly talented middleweight who almost never lost and regularly engaged bigger opponents at light heavy and heavy. By 1912, boxing reporters were already marvelling at Jack Dillon’s toughness and endurance, and offering all manner of plausible and fanciful theories on why the Hoosier Bearcat had never been knocked off his feet. One wrote: “Jack’s unique record is due to his perfect health combined with his peculiar make-up. Dillon has a mighty chest and possesses perfect lung power. His head is not overly large but is set on a short neck, which connects with the torso by a set of deeply buried muscles and ligaments of immense strength. In the early days, there were plenty of tough guys who came to test Jack Dillon’s heart action and nerve centre. In 1911, at the Indianapolis Auditorium, Jack hooked up with the incredible Bob Moha for the first of their five-fight series. Moha was quite a character, often referred to as the Milwaukee Wild Man or The Caveman. Bear-like in physique, Bob was described by one ringsider as having Jack Johnson’s arms and Sam Langford’s stature. Moha’s tussle with Dillon was hailed as one of the best fights ever seen in Indianapolis, but Dillon always controlled the action. Wild man Bob moved around the ring with surprising grace, but he was clearly hurt and flustered by Dillon’s constant raids, as Jack rushed in hurling lefts and rights. Occasionally, Moha would sneak an effective left uppercut through Dillon’s guard, but Jack confirmed his superiority in the eighth round when he launched a major two-fisted attack and drove Moha all over the ring. No official decision was rendered, but the unanimous popular vote went to Jack. Two years later, in May 1913, Jack Dillon sought to even the score with Frank Klaus in a ten-rounds fight at the Washington Park Arena in Indianapolis. The two men had already battled to a pair of no-decisions, but Klaus had clinched the one that mattered with a 20-rounds verdict over Dillon at San Francisco in March, 1912. Frank had defended his middleweight championship claim in that battle, but a wholly different story unfolded in the fourth meeting at Washington Park. Typical of Jack’s tough luck, Klaus did not defend his title claim in this contest. By the time of the fight’s conclusion, most ringsiders in the crowd of 11,000 felt that Frank had a lofty opinion of himself in parading as the world’s premier middleweight. Klaus, clearly unsettled by Dillon’s buzzsaw style, spent most of the contest clinching and trying to block Jack’s incoming blows. There were times when Dillon outpunched Frank by a ratio of eight to one. After a slow start, Jack outboxed and outfought Klaus completely through the last five rounds. The crowd got impatient with Frank’s defensive tactics in the early going, and Jack found it difficult to force the cagey Klaus out of his shell. From the sixth round, Dillon upped his workrate and began to accumulate points with accurate jabs and hurtful blows to the face. Klaus bled throughout the fight, but both boys looked strong all the way. By the ninth round, Frank appeared groggy from Dillon’s persistent attention. Jack hooked a left to the face and then chased Klaus all over the ring, firing off lefts and rights. Klaus held Dillon and then ducked under a big right swing, but Jack nailed Frank with another right that nearly floored him. Dillon won the round comfortably and now it was just a matter of sealing the unofficial victory. Jack’s damaging left hook, which had now become famous in fight circles, was employed along with jolting uppercuts to have Frank on the retreat. Dillon landed five uppercuts in a row at one point and was virtually hitting Klaus at will as the bout drew to a close. Few were left in any doubt that Jack Dillon was the greatest middleweight in the world. By 1915, Jack must have been feeling as wanted as Typhoid Tom. Other contenders searching for prospective opponents took good care to leave Dillon off their shopping list. Jack Dillon was now one of the most feared fighters in the sport, with all the ups and downs that such a reputation brings. In an effort to shake some of the shy contenders out of the tree, Jimmy Johnston of the St Nicholas Arena in New York, made a standing offer to match any light heavyweight in the world against Dillon, who was generally acknowledged as the unofficial kingpin of the light heavies and the middleweights. Some months later, writer Lowell McCormick, in mischievous humour, posed the following questions: “Did the pugs in the east rush Jimmy Johnston off his feet in their eagerness to sign up articles for a bout? Did all the promising young huskies jump at the chance to take a crack at the champion? The answer is no – the offer remains untouched to this very day. “Last winter, Charley Weinert won a long string of victories and was being unanimously acclaimed as being one of the cleverest of the middleweights that had ever donned the mitts. And then he met Jack and his winning streak was given an abrupt and jarring quietus when a strong Dillon left intimate acquaintance with one of the vital spots of his anatomy. If Charley Weinert lacked willingness, he certainly wasn’t devoid of common sense in steering a wide berth of Dillon. In November, 1914, Jack stopped Charley in two rounds at the Olympia Athletic Club in Philadelphia. A year later, at Madison Square Garden, Weinert’s beating was more prolonged. In fact he didn’t just get beaten. He got shredded and darn nearly decapitated on several occasions. Charley was being groomed as a challenger to heavyweight champion, Jess Willard, but received a terrific hammering from Jack The Giant Killer. Outweighed by fifteen pounds and out-reached by six inches, Dillon repeatedly pumped punches to Weinert’s stomach until Charley’s head finally began to dip. It seemed at times that it might be torn from his neck as Jack repeatedly connected with vicious blows. Weinert was nearly knocked out in the fifth and ninth rounds, being saved by the bell on both occasions. Assessing Jack Dillon’s many fighting strengths, Lowell McCormick wrote: “Dillon has a left hook that is the terror of all other ring artists of his weight. “In one respect, Jack Dillon is a close resemblance to old Bob Fitzsimmons. He can fight in three classes – middleweight, light heavyweight and heavyweight. Bob is the only man in the world that ever held championships at all three weights. It is Dillon’s ambition to equal old Fitz’s performance. “A glance over Dillon’s record shows that he has been one of the busiest fighters that ever donned the gloves. He is a glutton for work and in addition always likes to mix it up. While Jack Dillon found it frustratingly hard to lure the big names out of their rabbit holes, there was certainly no shortage of fights to be had. There never was in Jack’s incredibly competitive era. Consider that in 1915 alone, he had twenty-seven fights that are known to us. In just under eight years since turning pro in 1908, Jack had put more than 170 recorded battles on his log. It is quite permissible to draw a sharp breath at those statistics or even fall off your chair. We simply don’t know the like of it these days. Indianapolis, Ind., August 12, 1915. Mr Ed Harter, Norval Hotel, Lima, Ohio. My Dear Sir: In accepting your terms for Dillon to box this big tough fellow, I am taking in consideration the fact that you have the hustling ability to present the match to the public in a way that will make them realise that they are seeing the greatest of the present day boxers in action. I am enclosing to you, under separate cover, some latest photos of the champ, which I hope will be of some use to you. Lima is one real town and the boxing game conducted on business principles and honesty will draw good. Dillon stopped Yankee Gilbert in four rounds. Jack Dillon kept his promise and went hunting for bigger game. Initially the dreadnoughts weren’t afraid to take him on. They figured that a little fellow like Jack, for all his furious glove tossing, couldn’t do them that much harm. Two men who were given sobering cause to revise that haughty opinion were Gunboat Smith and Frank Moran. By the time the fight was over, however, pink was most definitely the prevailing hue. It was the colour of Gunboat Smith’s body from the neck down from where Dillon had been pounding it. Jack’s consistent body attack was the cornerstone of his overwhelming triumph. Most ringsiders could only give Smith a share of the eighth and tenth rounds. Dillon was altogether stronger and more versatile than the Gunboat. Jack showed his deft skills by repeatedly making Smith miss, either by shoving the Gunboat’s leads to one side with the left glove or by slipping them. Smith tried earnestly and improved his work in the later rounds, but his ten-pound weight advantage failed to make an impression. Dillon trumped him completely in power and speed. Jack was a master in the clinches, hustling all the time and thumping meaty blows to the body. The gutsy Gunboat never took a backward step, but he was like a man trying to trap a tornado in a jar. If the Gunboat got a shock, then big Frank Moran, he of the Mary Ann right hand, got a bigger one at Washington Park in Brooklyn on June 29, 1916. Frank was riding high, fresh from giving world champion Jess Willard a respectable argument. But how Frank underestimated Jack Dillon! Moran’s attitude was perhaps understandable. Willard was the biggest man in the game, freakishly so for that era. Jack Dillon seemed like a pygmy by comparison at 170lbs. Frank, with his 204lbs of beef, would quickly sweep away this upstart who thought he could whip heavyweights. But those 204lbs of Moran’s didn’t form the finely chiselled body of an athlete. Frank trained for the Dillon fight at White Sulphur Springs in New York, but lacked enthusiasm and pep. Come fight time, many wondered if he had trained at all. ‘Hog fat’ was the expression used by some to describe his condition. Frank didn’t seem greatly concerned and his mind was obviously set on a quick knockout before moving on to more meaningful and appealing assignments. Then he shot his bolt. Going all out in the third round, Moran tried to blast Dillon out of the fight with a major assault. He hurt Jack badly with big punches to the head and body, but soon realised that Dillon was an exceptionally tough and ambitious man with a granite jaw. Jack showed great ring generalship under fire, cleverly skipping out of range whenever Frank set himself to fire his famous right. Moran kept swinging wildly, firing off the kind of hard and vicious blows that had shaken Willard. But Dillon was unflustered by the attack and Moran was equally unsuccessful in the fourth round when he expended the last of his energy. Frank was desperately tired thereafter and his punches lacked steam. His arms were like lead weights and he became an easy target for the quick and aggressive Dillon, who proceeded to give Moran a rare thrashing. Dillon certainly resembled the coming Jack Dempsey in miniature. Launching charge after charge, the Bearcat allowed Moran no respite, smashing lefts and rights to the head and body and mixing in jolting uppercuts and jabs. One thunderous right cracked against Frank’s nose and spattered his face with blood. Moran, all too aware that he had disastrously misjudged Dillon, clinched and leaned on at every opportunity, knowing now that he could well suffer the ultimate indignity of being knocked out. Jack cut Frank badly, loosened several of his teeth, gashed one of his eyes and administered a consistent beating to the body. It became an absolute rout and onlookers agreed at the end that Hoosier Jack had registered the greatest win of his career. It was reckoned that Dillon outpunched Moran by a ratio of five to one. Jack was consistently faster on his feet, outslugged Frank and outboxed him. There had been no hiding place for Moran, not even in the clinches where Dillon had pounded his body with cold expertise. Former heavyweight champion, James J Corbett, had some very firm opinions on what he had seen. Said Gentleman Jim: “There is no doubt as to the winner of last night’s encounter. The little bearcat from the west was too clever, too fast and knew too much for Moran. So the honours all go to Dillon. “For the first four rounds, it looked as though it would be a good fight, but Moran could not stand off nature and he slowed up terribly. He was so slow that Dillon walked around Moran, hitting him at every opportunity with no real defence offered. “The result, once more, proves that a little success is more than fatal; is absolutely dangerous. Moran entered the ring in very poor condition. He carried too much weight as everyone at the ringside could see. Moran made the costly mistake of not training faithfully and underestimating his opponent. “This has proved the downfall of many rising ring stars as the records will show. A fighter cannot be excused for entering the ring in poor shape, for that is something that should never happen. Famous referee Billy Roche was fond of Dillon and related an amusing story: “Dillon was at his best against the cumbersome giants of his time. He belted out Fireman Jim Flynn and knocked James J Corbett out of the heavyweight business when he tagged Tom Cowler, a big Englishman, with an explosive punch. Jim Corbett considered Cowler a coming champion. Jim sat near the Briton’s corner. It never was a good idea to underestimate ‘little’ Jack Dillon and many paid a savage price for doing so. In 1915, the highly confident Norman (Kid) Anthony volunteered to lace ‘em up with Jack at Dillon’s training camp. The Kid had spent the whole day telling anyone who would listen what a good boxer he was. In the light of what transpired, it was difficult to gauge the Kid’s talent. Dillon smashed him on the nose with one punch and knocked him out in the first round.